Deemed one of the most important pre wedding ceremonies not only in Hindu weddings but in other religions as well, the event of engagement is mostly an intimate one with close relatives and friends from both bride and groom's side. This event usually takes place a few months before the wedding. During the ceremony, the fathers of both about to be married individuals vouch for the virtues of their child and make a formal wedding announcement of their children to the invited guests. The bride and the groom then exchange rings during to solidify their engagement. 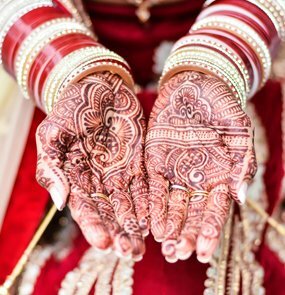 Mehendi Ceremony is about applying Henna to the bride's hand and feet (in some states it is applied to the groom as well). This beautiful event takes place usually in the evening amidst a lot of dancing and music by the family members and friends. While the bride has to sit for hours to get the Mehendi art done, many of the female guests also get the Mehendi art done on at least on one hand. This joyous celebration is often sees its complement with singing of traditional songs as well as playing of traditional music instruments like dholak. Seen as a women centric event, Sangeet is probably the most fun Hindu pre wedding ceremony. 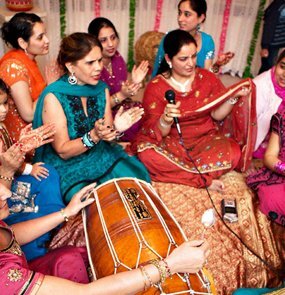 Traditionally, the Sangeet Ceremonies should be a part of the formal engagement event, however in recent times, it is conducted individually. Thus the fun of wedding extends one more day with this celebration. Earlier sangeet ceremonies were only the part of North Indian Hindu wedding, now this fun event has made its presence felt even in South India. It is worth noting that not only this event is fun but also wedding planners swear by it stating it truly help the two sides forget about the wedding jitters for sometime. Therefore, one can see that special themes are chosen for this occasion and dance performances are prepared. Tilak Ceremony is reckoned as the first step to the bond between the two families. This auspicious event takes place mostly in the groom's residence, where the male members of the bride's family visit to put Kumkum or vermilion on his forehead. Though there are many versions of Tilak ceremony in different parts of the state, the one mentioned one is commonly witnessed. Apart from this, music and dance is also a major part of this ceremony in many states of the country. Amongst the most fun events during an Indian wedding is the Haldi Ceremony. One can find variants of this auspicious event in different parts of the country. 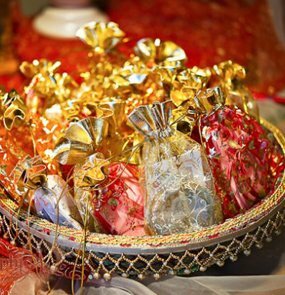 In this ceremony a paste of haldi is applied on the bride and the groom's body before or in the morning of their wedding day. In few states of India, this ceremony is held after the mehendi ritual. The mixture used in the ceremony is known by different names in different regions, like ubtan, mandha, tel baan etc. Haldi ceremony is directly connected with beautifying the bride and the groom for their big day. The colour yellow is also considered auspicious, and thus is said to ward off the evil. Roka ceremony is considered to be the first step towards the marriage. It is like an official announcement of the consent of both the bride and the groom to get married to each other. In this ceremony, the families of two sides gather for the first time and exchange sweets, gifts and dry fruits with each other. In some traditions, a puja is performed by the priest. Vidaai is an emotional event that marks of the completion of the wedding. It is an integral part of wedding, where the bride with teary eyes steps out of the doors and throws back five handfuls of rice over her head reflecting wealth and prosperity. In a way, this ritual signifies that bride has paid back whatever her parents have given her all these years. As she leaves in a car/vehicle, bride's brothers and cousins push the car, which symbolises that the brothers are helping her start a new life with her husband. After the car starts, money is thrown on the road to discard or ward off the evil spirits. This post wedding event has different names in different parts of the state but everywhere it is an important ceremony. This post wedding ceremony is basically a way of introducing bride to the groom's community. This event has no mandatory rituals to be followed, in fact the ceremony comes packed with dancing, music and a grand feast. Mostly referred as an Aashirvaad Ceremony, this very soulful event is celebrated to seek the blessings of the elderly members of the family and other well wishers. 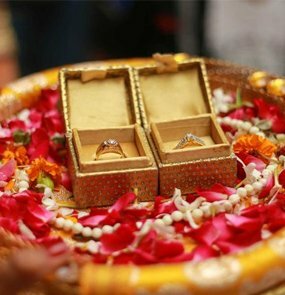 For this ceremony, the bride's family along with relatives and friends visit groom's residence and present the newly wed couple sweets or fruits along with gold/silver/diamond jewelry, the couples then touch their feet. In some parts of the country, like Bengal, the Ashirwad ceremony is held two or three prior to the wedding event. It signifies, the confirmation of the bride and groom's new relationship. The door of bride's residence is decorated with a string of mango leaves that are to stay for one year after the wedding event. The groom's family present to the bride some sarees, and in return, the bride's parents gift various groom a ring or a watch. This fun ceremony can mostly be seen in North Indian weddings. Dwar Rokai ceremony is held when newly wed couple arrives at groom's residence and his sister/s confronts the couple by not allowing them to enter the house. The brother is asked to present her with cash or a precious gift in order to get the entry inside the house. Often this is a fun ceremony to witness with very light hearted argument between the brother and sister. Dwar Rokai Ceremony is followed by the Griha Pravesh Ceremony. In this significant ceremony, a traditional Indian welcome is given to the new bride. She is asked to first push a jar/kalash filled with rice with her right toe to make her entry into the house. This ceremony signifies that the family of groom has not only welcomed the bride into their house but has also accepted her as one of the integral members of their family. 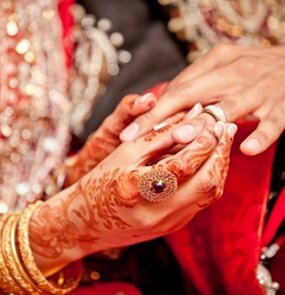 In some places in India, the bride is asked to tell the name of her husband at the entrance and then enters the home. Mooh Dikhai is an important Hindu post wedding ceremony. It is basically held to introduce the new bride to the groom's family. The ladies unveil the face of bride and also shower her with gifts. The mother-in-law, in particular, offers presents to the bride as a gesture of welcome. Pag Phera is also observed as an important Hindu post-wedding ceremony. In this ceremony, the bride is taken back to her home from the in-laws' house by her brothers, where she stays for almost three days. When the ceremony ends, the groom comes to her house and seeks blessings from her parents and then take his bride back to his house. The family of the bride offers gifts to their daughter and son-in-law. It is believed that girls are the form of Goddess Lakshmi, and thus the bride comes back to her home to ensure prosperity of her parents.